A successful manager is a bit of a subjective goal. 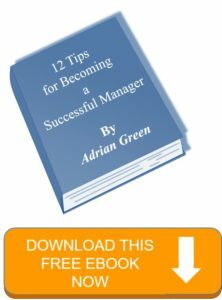 What is a successful manager? What are their behaviours, values, attributes, skills? How do you measure “success”? When most of us first become a manager we look at managers we have worked for a try to do those things that worked on us. We also try to not do those things that we didn’t like. However, when the pressure is on, we are likely to revert to those behaviours we didn’t like such as becoming more directive, focusing only on the task and not on the individual or the team, taking control and leading from the front. These behaviours can be a good choice if you have earned trust and respect from your people. They will then accept that you are changing style for good reason. You might then be able to call yourself a successful manager. Try these twelve tips below. These work particularly well when you have been promoted from within the team to now be the team boss. If you still need some guidance then download the two ebooks from the links on this page or contact me via this website and ask. The temptation is to emulate the previous manager. This is bad news as you are not the previous manager, you are you. Think about successful managers you have enjoyed working for and identify what it was they did that gave you that feeling. Also, think about managers you have not enjoyed working for and identify what it was they did that gave you that feeling. These two activities will give you a framework from which to start your career towards becoming a successful manager. Set clear standards and then model them – always. People respond positively to certainty as they generally don’t like surprises. Everyone needs to know what is expected of them and clear standards will help them understand that this is the way we are going to do things around here. It doesn’t have to be dictatorial either. Why not ask your team to put together their ideas on what the standards should be and then agree them with you. That way they have the ownership so you don’t need to motivate them to live by the standards. People respond to being given responsibility. OK you always get one or two people who moan and groan about you abdicating your responsibilities to them. Get rid of these people, or re-train them, as they will be trying to infect the team against you. Being decisive like this is a key step towards becoming a successful manager as you will impress your team and show them that you care about your responsibilities and about them as people. You can do this both as a team and more regularly as individuals. Once a month on an individual basis is a good way to work. Talk to each person about what they are working towards and the resources they have to do it with. Give them feedback about how they are performing (good and developmental feedback) and agree what you can do to help them in the following month. Or better still get them to come up with them. Rituals are important as they confirm to the team members that they each belong to something. This is a motivator in it’s own right. Such rituals might include regular social events, team building days and team meetings. You are now a manager which means that your job is to manage other people doing the work. If you find yourself doing the work, then you are not being a successful manager but an overpaid worker. If you look to their expertise in doing the job they will respect your expertise in managing them. Look to your team for the solutions to problems rather than try and solve them for yourself. People like problem solving and will be motivated by you involving them. Creativity is in all of us. It just needs encouraging out. They will probably come up with better solutions than you could have anyway. You will make mistakes – that is, if you are human! Be open about them and ask your team for help in avoiding making the same mistake again. If you make yourself approachable they will be relaxed about giving you feedback which may help prevent mistakes in the future. Some successful managers are not good leaders. The art is in knowing when to delegate. You will be developing your staff if you delegate leadership experiences. You will still retain overall control because you will always retain accountability, so learn to trust your staff – they don’t have a choice with you. Becoming a successful manager is not an end point but the start of a new direction in your career. Managing is a skill which needs to be learned and practised and then learned some more. You will never reach the point where you will not need training and developing, so get yourself on some good courses, read management books (some of them are fun to read believe it or not) and sign up for some e-learning. Just because you are now a successful manager, it doesn’t mean you have to change your friends. They need to understand that you are being held accountable for their work and so there will be times when you have to be directive but there will be more times when you have to rely on them to help you. Successful managers do not build barriers against people. Being a successful manager is about earning respect from being seen to be fair, trustworthy and approachable. 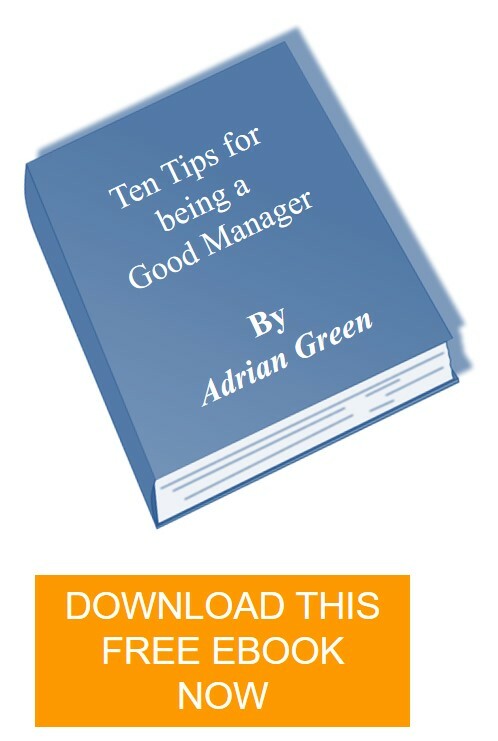 This ebook will give an additional ten tips for being a good manager.